A common challenge when attempting to make a graphene-based sensor is the high levels of electronic noise that are caused, reducing its effectiveness. In a recent work, an international team of researchers proposed a graphene-based semiconductor device that reduces electronic noise when its electric charge is neutral (referred to as its neutrality point). The group achieved this neutrality point without the need for bulky magnetic equipment that had previously prevented these approaches from being used in portable sensor applications. In a proof-of-concept device, the researchers used their new sensing scheme to detect HIV-related DNA hybridization at picomolar concentrations. The team fabricated a charge detector out of graphene that can detect very small amounts of charges close to its surface. The sensing principle of the device relies on charge species detection through the field-effect, which brings about a change in electrical conductance of graphene upon adsorption of a charged molecule on the sensor surface. “Graphene is perfect for such application,” explained members of the team. 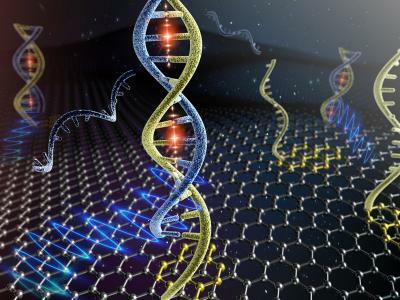 “Graphene is unique among other solid-state materials in that all carbon atoms are located on the surface, making the graphene surface highly sensitive for detection of changes in the environment.” However, the team notes that the ability to create practical electrochemically gated graphene-based field-effect transistors to detect charged species also requires a small amount of electronic noise, the existence of which fundamentally limits a sensor’s resolution. The researchers add that electronic noise can be reduced without compromising the sensing response, enabling significant improvement to the signal-to-noise ratio compared to that of a conventionally operated graphene transistor to measure conductance. This noise reduction and maintaining of the sensing response is achieved by making use of one of the unique properties of graphene field-effect transistors: its ambipolar (being both n- or p-type) behavior near the neutrality point. This neutrality point appears in graphene as the lowest point of conductance in the material and is the result of graphene’s unique electronic band structure. At this low conductance point, the graphene sensors can operate at a lower noise level. While this doesn’t compromise the sensing response, it does lower the signal-to-noise ratio of the device, resulting in an overall improved sensing response. Another feature of the latest device is the use of so-called in-situ 'electrochemical cleaning' to ensure a clean graphene surface, which is a new technique meant to enable graphene electronic biosensors to provide reliable performance. While they were able to test their sensing scheme on HIV, more work must be done before this device could find its way into the next generation of biochemical sensors. First of all, the team believes that there is a need to scale up the miniaturized graphene electronic arrays. In addition, microfluidic or nanofludic liquid handling should also be integrated into the arrays. There will also be a need for on-site electrochemical cleaning on each of the devices and the more surface functionalization to suit different cases of biomolecule detection. The researchers intend to adopt this low-noise technology for other single molecule detection methods and evaluate the sensor performances when scaled up.